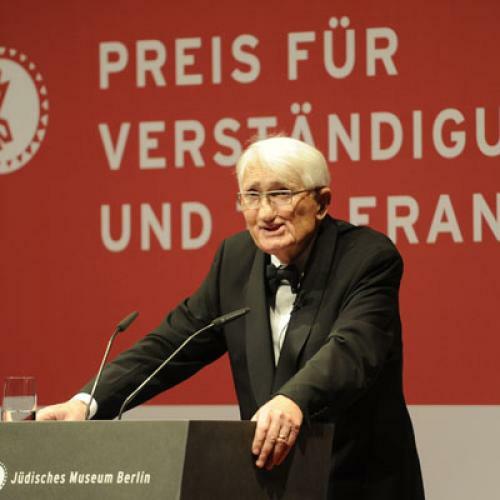 On October 14, 2001, the German philosopher Jürgen Habermas stepped up to the lectern at the Paulskirche in Frankfurt to deliver a short address called “Faith and Knowledge.” The occasion was his acceptance speech of the Peace Prize, a yearly honor that the German Book Trade organization has bestowed for more than fifty years upon intellectuals, writers, and artists from across the globe. The prize was well-deserved: more than any other philosopher in living memory, Habermas has gained international prestige not only for his philosophical labors but also for his spirited role as a public critic who has not wavered in his commitment to the ideal of a just and rational society. Granted, these days Europe is going through a period of diminished expectations: as the European Union falls into economic disarray, older dreams of tolerance and social inclusion have lost ground. Ruling conservative parties in Germany, England, and France have rushed to embrace shortsighted policies of privatization even while they compete against the far right in a cynical game of vote-mongering xenophobia. There is little cause for hope. This is what makes Habermas’s speech ten years ago so remarkable. Before that date, the German philosopher rarely addressed themes of religion. Since that date, he rarely speaks about anything else. In 2004 he met at the Catholic Academy in Bavaria with then-Cardinal Joseph Ratzinger (now Pope Benedict XVI) for a philosophical discussion concerning the role of religion in public life, now available in English as The Dialectics of Secularization: On Reason and Religion. His most expansive volume of essays on religious matters appeared in 2008 as Between Naturalism and Religion. In 2010 his Munich conversation with a group of Jesuit theologians was published in English as An Awareness of What Is Missing: Faith and Reason in a Post-Secular Age. And more recently he met in New York with three philosophers (Charles Taylor, Judith Butler, and Cornel West) for a public colloquy, the transcript of which has appeared as The Power of Religion in the Public Sphere. All of this is rumored to be the preparatory labor for a new and major work on religion that, so far, has appeared only in fragments. The sheer intensity of this turn in Habermas’s concerns is striking, especially in a thinker who has never betrayed any sign of personal faith. Habermas was and apparently remains “religiously unmusical” (to cite Weber’s famous phrase). But at least one critic has announced this as a “turn” in Habermas’s thinking, prompting the thought that we may be witnessing an intellectual conversio, after the Latin vertere, to turn or to change. When he delivered his acceptance speech at the Paulskirche, Habermas was well past his seventy-first birthday: one could imagine he had entered upon a phase of thinking where the former confidence in systematic reason is giving way before the existential questions that confront us all. One could even characterize this phase as a Spätstil, or late style—a term that his teacher Adorno used to describe the more fragmentary and experimental compositions of the aging Beethoven. But such talk of a secular conversion in Habermas’s recent work risks serious misunderstanding. Readers sympathetic to religion may rush to conclude that the paradigmatic philosopher of modern reason has at last seen the light, while stolid advocates of secularism may despair that a cherished ally has fled the camp. The worst (and clumsiest) mistake appeared in a 2010 New York Times column by Stanley Fish, who announced that Habermas had come to recognize the “inability” of secular society “to go it alone.” The problem is not merely that “going it alone” is too casual a phrase to capture Habermas’s intentions. Fish sought to prove this idea by quoting a line by Habermas that appears in the editor’s introduction to An Awareness of What Is Missing. “Among the modern societies,” Habermas wrote, “only those that are able to introduce into the secular domain the essential contents of their religious traditions which point beyond the merely human realm will also be able to rescue the substance of the human.” It is a striking turn of phrase, but its significance is uncertain. Did Habermas mean to say that religion contains insights indispensable for humanity, insights that secular reason cannot surpass? Fish thought so. The problem is that the German editor was quoting from a speech Habermas gave for the eightieth birthday of Gershom Scholem, the great historian of Jewish mysticism, more than thirty years ago, and Habermas was explaining Scholem’s perspective, not his own. To understand what Habermas is really up to in his most recent work requires the kind of patience and precision that has been in terrifically short supply in much of the popular controversies concerning the place of religion in modern politics. It is our good fortune that much of what Habermas has written now appears in English collections—Religion and Rationality: Essays on Reason, God, and Modernity (2002) and The Frankfurt School on Religion (2004)—both edited by Eduardo Mendieta, who brings to this task a rare combination of theological sensitivity and theoretical rigor. When viewed in this wider perspective, Habermas’s turn to religion no longer comes as a great surprise. On the contrary, it should strike us as a natural amplification of philosophical and political themes that have preoccupied him for many years. HABERMAS CAME TO maturity as a philosopher in the left-Hegelian tradition of Western Marxism, which typically excoriated religion as an illusory diversion from the profane task of this-worldly redemption. In his Contribution to the Critique of Hegel’s Philosophy of Right in 1843, Marx offered a definition: “Religion is the sigh of the oppressed creature, the heart of a heartless world, and the soul of soulless conditions.” He then added the famous line: “It is the opium of the people.” But Marx did not mean to suggest that getting over religion was a simple affair of casting aside false beliefs. (The opium-analogy is revealing: kicking a drug habit is hardly easy.) The thought was that religion serves a compensatory function insofar as it offers an unfree humanity a fantasy—an image of happiness—that reconciles them to their present unhappiness. This is why one cannot hope to redeem humanity from its unhappiness if one confines oneself only to the intellectual criticism of religion. One has to change the unhappy conditions for which religion offers compensation: “The abolition of religion as the illusory happiness of the people is the demand for their real happiness. To call on them to give up their illusions about their condition is to call on them to give up a condition that requires illusions. The criticism of religion is, therefore, in embryo, the criticism of that vale of tears of which religion is the halo.” But there is an ambiguity in this theory. Did Marx mean to suggest that religion does nothing but conspire to obscure the actual conditions of our unhappiness? That is an observation only about the social function of religion rather than its propositional content. Marx also seemed to be saying that religion may contain the right insights—our suffering must be overcome, our hope for happiness deserves satisfaction—only those insights are applied to the wrong realm, a metaphysical beyond rather than the profane space of human action. More than a hundred years separate Marx from Habermas. In the interim much—everything, nearly—has changed. After Stalinism and the Gulag, Habermas abandoned both the revolutionary ambitions and the shabby apologetics for violence and dictatorship that brought the Marxist tradition rightly into disrepute. In his practical politics Habermas seems to have long ago made his peace with the welfare state and the ameliorative style of European social democracy that accepts both private property and the inevitable diversity of interest group factionalism in the parliamentary system. What remains of Marxism in Habermas’s philosophy is due chiefly to the fact that he was raised on the insights of the Frankfurt School as developed by his teachers Adorno and Horkheimer—philosophers for whom Marxism was no longer a theory of revolution but rather a “critical theory” to be used as a mirror for revealing the irrationality and imperfection of the present world. Habermas would eventually conclude that his teachers had backed themselves into a pessimistic corner: their condemnation of the “instrumental reason” that had culminated in Auschwitz left them helpless when it came to explaining the validity of their own critical efforts. What they called “the dialectic of Enlightenment” ended in a totalizing critique of reason as such. Habermas was not insensitive to the legacy of fascism: his own father had sympathized with the Nazis. But as a young man confronting the challenges of democracy in the postwar Bundesrepublik, he felt an intense need to turn critical theory toward more constructive ends. In 1962, The Structural Transformation of the Public Sphere: An Inquiry Into a Category of Bourgeois Society (written partly under the influence of Horkheimer, until the two had a falling out) laid down a highly stylized historical and sociological argument as to how eighteenth-century intellectuals and critics developed a practice of public debate that would become the core feature of modern democracy in the West. Institutions such as newspapers and coffeehouses served as the training ground for the activity of rational criticism—the give and take of public deliberation that ends only when the “unforced force” of the better argument carries the day. Habermas is no starry-eyed optimist; he knew that this was only the ideal. The burden of the book is to show how the reality of property exclusions meant that bourgeois practice always stood in starkest contradiction to its principles, and in the twentieth century ultimately decayed into a vacuous display of pseudo-democracy, short-circuited by modern forms of mass communication. But Habermas has nevertheless remained a passionate believer in the ideal. In his magnum opus, The Theory of Communicative Action, which appeared in 1981, he tried to show how the very structure of human language bears within itself the promise of mutual understanding and rational consensus: an ideal that can serve as the groundwork for a truly democratic polity. Such themes earned Habermas his reputation as a philosopher in the post-Kantian tradition who was chiefly concerned to secure the legitimacy of modern reason, or what he once called “the unfinished project of modernity.” He did not leave the impression of being keenly interested in religion’s persistence, let alone its legitimacy. But this reputation has always been only half right. In fact Habermas has been wrestling for a great many years with the classic theorists in the sociology of religion, Weber and Durkheim, and in the process he worked out rather distinctive views concerning the historical passage from religion to modernity. In The Theory of Communicative Action, he readily granted that no society can construct itself out of nothing: we are born, after all, into particular cultures, and we are burdened from the start with thick and rarely questioned ideas of what is the right way to live. This concession to the German school of hermeneutics helps to explain why Habermas has rarely sounded like a liberal of the Anglo-Saxon style: the contractualist model that imagines we can lift ourselves free of our cultural horizon fails to recognize just how much of ourselves—our culture and our history—we drag along with us as we move forward. Every culture begins by holding certain truths as sacred and virtually unquestionable. Still, if reason is to enjoy a truly critical role as the medium for democratic self-authorization, then it is difficult to see how anything in human experience could be permitted to remain wholly immune from rational scrutiny. It follows that, as reason expands its reach, the contents of our religious heritage must undergo a trial of rationalization. The ideas that a civilization once considered beyond scrutiny must eventually be re-fashioned into propositional claims that are susceptible to criticism. Habermas calls this process “the linguistification of the sacred.” A good illustration (and one that Habermas endorses) is the transformation in world religions that Karl Jaspers described as the “Axial Revolution,” when cultures in the Near and Far East began to re-conceive their divinities as no longer immanent but transcendent beings, who articulated the society’s sense of the highest good in principles or commands. Plato’s idea of a Good beyond Being is one example; the monotheistic idea of God as author of the revealed law is another. But once these ideals were drawn into human discourse, they were exposed to rational reflection. We may have begun by imagining the divine as the sole source of our moral codes, but when we were awakened to the possibility that these codes can be challenged, our capacity for self-direction eventually outstripped our original experience of religious awe. The critique of the sacred therefore turns out to be the original model for the ongoing historical drama by which humanity came to understand itself as author of its own fate. Religion and Enlightenment are not eternal foes, since religion serves as reason’s point of departure. But the departure is necessary. THIS WAS AN argument that Habermas worked out nearly thirty years ago in The Theory of Communicative Action. It is therefore crucial to note that his recent turn to religion rests upon a formidable bedrock of preparatory theory in both the philosophy and the sociology of religion. This earlier theory looks like an unapologetic defense of the Enlightenment: it implies that a certain kind of secularization is a prerequisite for modern democracy. Has Habermas now changed his mind? The task is all the more urgent for all those European democracies that were once relatively homogenous but now confront the challenge of cooperation within increasingly multi-cultural and multireligious societies—the situation not only in Germany (with its thriving Turkish subculture) but for much of Western Europe. The challenge of this new situation is not easily managed, but it is easily manipulated. It has provoked waves of xenophobic backlash, especially from politicians on the right who nourish unreal but demogogically advantageous dreams of restoring the European nation-states to a set of isolationist monocultures—a dream that (one might have thought) should have died a well-deserved death with the collapse of the Third Reich. But it is important to realize that there is a powerful strain of conservative ideology in Europe that continues to believe that Christianity is a necessary component of modern civilization. Many theorists of democracy prefer to regard the secular Enlightenment as a precondition for the rise of democratic institutions, but for a significant group of conservative political theorists associated with Angela Merkel and the Christian Democratic Union (CDU)—alongside the Christian Social Union, its smaller ally in predominantly Catholic Bavaria—Nazism was in essence a movement of modern paganism. Drawing upon arguments first developed in the interwar era by the controversial legal theorist Carl Schmitt, postwar conservative philosophers and Christian political theorists placed the blame for Nazism’s success on the overzealous process of secularization itself—a process that in their view ended by evacuating European civilization of the moral and religious resources it needed to survive. The idea of translation works especially well in the context of modern democratic society where we all have to be ready, if pressed, to furnish intelligible reasons for our arguments and the policies that we advocate. Yet if these reasons are to be binding for all members of our society, they cannot be reasons that presuppose everyone shares allegiance to the very same metaphysical vision of reality. As John Rawls explained, it is one of the burdens of modern democracy in a culturally non-homogeneous setting that each of us must submit to a certain relativization of moral vision: I can no longer expect that my neighbor draws from the same “comprehensive doctrine” as I do. Instead I must be willing to back up my claims with reasons that all other citizens could recognize as at least potentially binding no matter what comprehensive doctrines they may hold. This is the price one must be willing to pay if democratic procedures are to survive. Religious citizens who regard themselves as loyal members of a constitutional democracy must accept the translation proviso as the price to be paid for the neutrality of the state authority toward competing worldviews. For secular citizens, the same ethics of citizenship entails a complementary burden. By the duty of reciprocal accountability toward all citizens, including religious ones, they are obliged not to publicly dismiss religious contributions to political opinion and will formation as mere noise, or even nonsense, from the start. Secular and religious citizens must meet in their public use of reason at eye level. Clearly Habermas is keen to present these two requirements as distributing an equal burden on both participants. “The one presupposition,” he writes, “is no more trivial from a theological perspective than the other is from that of philosophy.” But is the burden of translation truly equal? Does it even make sense to say they are both burdens? Consider the analogy of translation between profane languages: If a Frenchman is asked to express his claims in public where English is the only language in principle intelligible to all participants, then of course the Frenchman can be required to obey the rules of English grammar. That is surely a burden, and it may be a great challenge for someone who has spent his entire life thinking in French. But it makes no sense to say that the Englishman bears a symmetrical burden because he cannot think of himself as a “judge” concerning the comprehensive merits of France. There is nothing about speaking English that makes such a judgment plausible, let alone necessary. Habermas, I suspect, is trying to dress up the unidirectionality of the burdens of translation in a way that promotes a more favorable vision of reciprocity. This may be diplomatic—and, given the frequent intolerance of both parties, religious and secularist, some diplomacy may be called for—but the notion of a shared burden in translation does not accurately capture Habermas’s deeper commitments to profane reason. Translation, after all, is a linguistic event of semantic transfer, from a language of origin to a target language—from religion to the secular public sphere. The analogy thus reveals how Habermas’s earliest ideas concerning the character of public reason have not lost their validity. What Habermas used to call the “linguistification of the sacred” he now calls translation. To be sure, there has been a small modification: he no longer pretends to know how the story will turn out. The premise of a fully secularized endpoint has been surrendered, and with it the entire historical narrative has ceded its authority for the sake of an open-ended procedure. The theory of translation is essentially a theory of unidirectional, consensus-oriented secularization that has been stripped of its historical meaning and mapped onto the horizontal experience of democratic discourse itself. A deeper objection would be that there is nothing in religion that is so indispensable that it requires the salvaging work of translation. After all, aren’t there other sources of instruction besides religious ones? On this point Habermas remains tellingly uncertain. He readily acknowledges that religious rituals and practices remain deeply affecting for many of us in ways that appear to have no obvious secular counterpart. In An Awareness of What Is Missing, the Munich colloquy with Jesuit theologians, he introduced his lecture with a brief anecdote concerning a memorial service for the author Max Frisch. Though the service was held in St. Peter’s Church in Zürich, the deceased was an agnostic who had left explicit instruction that there should be no “amen” and that no religious rite accompany his burial. Habermas suggests that this event may tell us something important about secular modernity, which feeds off religious sources of meaning it can only acknowledge with great reluctance. But one should avoid the precipitous conclusion that Habermas is really endorsing religion and condemning reason for some kind of congenital poverty. Habermas risked serious misunderstanding when he employed language concerning “what is missing.” The German phrase—“was fehlt”—refers to an old remark by Adorno from a radio conversation about religion with the philosopher Ernst Bloch (and they were quoting a phrase from the Brecht-Weill opera Mahagonny, “Aber etwas fehlt”; “but something’s missing”). One of Habermas’s conversation partners heard this phrase and launched into a complex disquisition on the meaning of “what is missing,” and for whom it is missing, and in what sense it is missing. His implication seemed to be that Habermas must have meant the obvious: that for secular reason, what is missing is God. But surely this was a confusion. The left-Hegelian notion of an absent fragment was important to Adorno because he believed religious concepts—specifically, the concept of redemption—cast a critical light on an imperfect world, revealing its fissures and its disunity. What is “missing” is the genuine unity of a world reconciled with itself, a world that is rational not merely in promise but also in substance. In his response Habermas explains that the phrase had occurred to him because he had been reading a book by the leftist theologian Johann Baptist Metz, who, like Habermas himself, drew inspiration from Adorno. For his religious interlocutors it may have seemed that Habermas was ready to concede the notion that reason is incapable of generating the deepest moral intuitions without God’s aid. What Habermas actually meant, it seems, was far more modest: reason is fallible, and as such it should not dismiss the possibility that religious traditions may bear invaluable gifts. HABERMAS'S THEORY of secularization as translation holds a further and more political significance in the context of contemporary quarrels over the status of Muslims in Germany. The old conservative idea that German democracy rests upon distinctively Christian foundations recently enjoyed an unpleasant reprisal when Thilo Sarrazin, a Social Democrat and former Bundesbank board member, published a highly xenophobic book under the title Deutschland schafft sich ab, or Germany Does Away With Itself. Laden with specious but authoritative-sounding statistics, the book laid out an aggressive case against further immigration from primarily Muslim countries, on the assumption of lower intelligence and an ostensibly innate hostility toward democracy. Sarrazin was also quoted in the press worldwide with remarks such as the following: “I don’t have to recognize anyone who lives from the state, rejects that state, refuses to ensure his children receive an education, and continues to produce little headscarfed girls.” What was most distressing about the Sarrazin case was not the book itself, but the fact that it found an eager audience and immediately became a best-seller. Chancellor Angela Merkel, who has been known for defending a more liberal immigration policy against most conservative members of her party, was quick to grant an interview in the Turkish press in which she criticized Sarrazin’s statements as “absurd” while adding that “many Turks live in Germany, and I think most of them have adapted really well.” But only a month later, in a speech in Potsdam to younger party members of her own CDU, Merkel announced that the ideal of a “multi-kulti” society had “utterly failed.” Sarrazin swiftly seized the chance a few days later to confirm that “multi-culturalism is dead.” Other European leaders—David Cameron and Nicolas Sarkozy—have been saying the same. In these debates Habermas has offered what amounts to an unusual defense of the embattled Muslim minority, with his suggestion that for the sake of democracy itself one should not exclude from the public sphere any religious culture whose normative insights might admit of translation. From the point of view of tactics alone, the argument is brilliant: it defeats advocates of conservative religion at their own game. He has been especially critical of conservatives who appeal to the idea of the West’s “Judeo-Christian” heritage to justify a new politics of exclusion on the premise that Muslims are somehow ill-suited for democracy. As Habermas remarked bitterly in a recent editorial, when German conservatives invoke Judaism for a new politics of xenophobia only sixty-five years after the last crematoria ceased burning, they demonstrate (at the very least) exceptionally bad taste. In his most recent books Habermas hastens to explain that in a modern democracy religious citizens, too, must submit to the reciprocal game of public critique. But he clearly intends his theory of translation as a gesture of inclusion: Germany is, in Habermas’s phrase, a “post-secular society.” Whatever their origins, and whatever their faith or lack thereof, both religious and non-religious citizens should be able to encounter each other on a common plane and in mutual respect. This is the urgent political question that runs through both An Awareness of What Is Missing and The Power of Religion in the Public Sphere. The latter is a far more intriguing work, chiefly because it brings Habermas into conversation with other philosophers who have reflected hard on the political status of modern religion. The Canadian-born philosopher and social theorist Charles Taylor, author of the monumental study A Secular Age (2007), gently dissents from Habermas’s notion that religion alone must bear the peculiar burden of translation into the neutral language of the public sphere. In Taylor’s view, the multi-ethnic and multi-religious “polysemy” of modern society requires that we sustain a neutral space for public deliberation—but we should conceive of this neutral sphere as a response to diversity, rather than as a response to something distinctively irrational or threatening about religion in particular. philosophy, even in its postmetaphysical form, will be able neither to replace nor to repress religion as long as religious language is the bearer of a semantic content that is inspiring and even indispensable, for this content eludes (for the time being?) the explanatory force of philosophical language and continues to resist translation into reasoning discourses. The parenthetical interrogative—“for the time being?”—is one of the strangest moments in all of Habermas’s recent work. But it is also among the most admirable. In a remarkable interview conducted with Habermas in 2002, Mendieta asked the philosopher to clarify whether this parenthetical remark meant that one day philosophy might be expected to “completely assimilate” all advantageous religious insights, or whether religion might “forever resist” all such efforts by secular reason. Habermas responded that he did not know: the answer would only come if philosophy carried out the work of translation with greater sensitivity than heretofore. That was the right answer. Against the intolerance of a secularism that is dogmatically certain of its independence from religion, and against the intolerance of a religiosity that is no less certain that it retains exclusive ownership rights on human morality, Habermas prudently—but on theoretically defensible grounds—refuses to take sides. As a philosophical modernist who remains open to unwritten possibilities, he believes that the process of translation will continue at least for the foreseeable future, and that the future alone will decide. Peter E. Gordon is a professor of history at Harvard University. He is the author, most recently, of Continental Divide: Heidegger, Cassirer, Davos (Harvard University Press).